Info "Hey, pick up the phone already!" Cold Call is one of Ashley's Microgames in WarioWare: Smooth Moves. 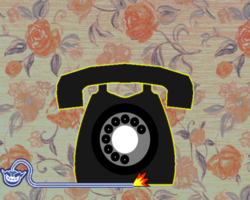 A telephone will ring at a random point, and the player must quickly pick it up. A person's voice comes through from the Wii Remote, saying things like "Hello, how are you?" and "Sorry, wrong number". 1st level difficulty: The telephone will ring. 2nd level difficulty: The telephone will ring. Sometimes the telephone stops ringing. 3rd level difficulty: A cellphone will ring. After picking it up the player has to press the button to answer it. This page was last edited on October 3, 2018, at 09:03.